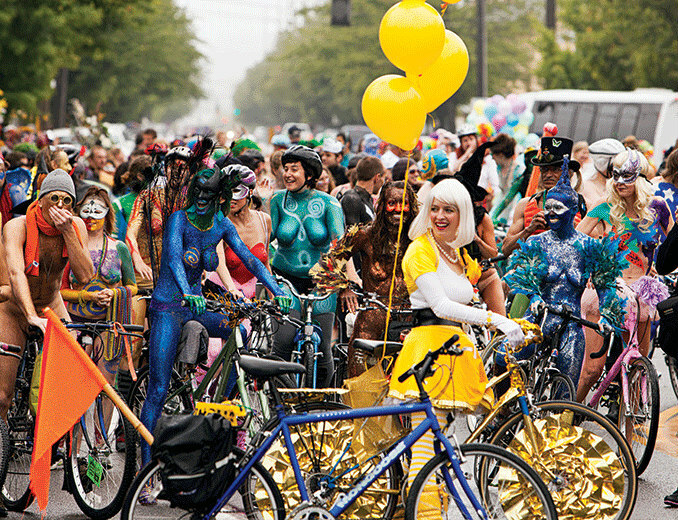 The clothing-optional ride is a colorful, freewheeling affair. 1. Have a paint plan. Will you be a striped tiger or a life-size Van Gogh painting? No worries if you don’t have ideas—other riders will help you out. 2. Get your paint early; it can become scarce. Textile acrylics, theatrical body paint or temporary tattoo paint work best. 3. Check in at the “paint party” on the day of the parade to get a wristband and learn the safety rules. (Information at solsticecyclist.org.) Paint yourself and get help from others for those hard-to-reach spots. 4. Painting your design can take from 30 minutes to several hours depending on its complexity, so plan accordingly. 5. Don't be afraid! You’ll be surprised how quickly you feel comfortable once surrounded by others painting. 6. Once the fun is done, use warm, soapy water and a washcloth to remove the paint. It may take awhile.